I feel like there is literally no better dentist- period. Dr. Morrison treats me like a family member. I would nottrust my teeth to anyone else. I feel like there is literally no better dentist- period. Dr. Morrison treats me like a family member. I would not trust my teeth to anyone else. Dr. Eric Morrison is an excellent dentist and an outstanding professional. He has a high standard of excellence - which healways achieves - from the details of all your dental work to the office environment to your experience as a patient. He is a caring and dedicated person, he goes above & beyond to work with you to make sure you are comfortable and that your questions are answered & your goals are met. I have travelled to see Dr. Morrison from multiple states over the years - by plane, train, & automobile. He now provides care for my family. I will continue to travel- 8 hours now - because you can only get this level of excellent care here. I get compliments on my smile & I eat comfortably now. Dr. Morrison and his team have made that possible. I look forward to my visits w/ Dr. Morrison & I highly recommend him to you. Dr. Eric Morrison is an excellent dentist and an outstanding professional. He has a high standard of excellence - which he always achieves - from the details of all your dentalwork to the office environment to your experience as a patient. He is a caring and dedicated person, he goes above & beyond to work with you to make sure you are comfortable and that your questions are answered & your goals are met. I have travelled to see Dr. Morrison from multiple states over the years - by plane, train, & automobile. He now provides care for my family. I will continue to travel- 8 hours now - because you can only get this level of excellent care here. I get compliments on my smile & I eat comfortably now. Dr. Morrison and his team have made that possible. I look forward to my visits w/ Dr. Morrison & I highly recommend him to you. Dr. Eric Morrison is recognized nationally for his extensive skill as a dentist and his innovative vision. A native Washingtonian, Dr. Morrison chose the D.C. metropolitan area as the home for his practice. Dr. Morrison’s style of practice has been acknowledged worldwide for its sophisticated blend of comfort, care, and quality. 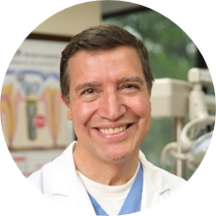 This delicate balance mixed with Dr. Morrison's compassion allows his patients to be at ease while improving or enhancing their greatest asset, their smile. Dr. Morrison was professional, gentle, and thorough. As always Dr. Morrison took his time and explain exactly what he was going to do before he did it. Dr. Morrison is an excellent dentist. I've been a patient of Dr. Morrison's for 18 months and drive over 50 miles one way to his office because he is simply the BEST! My children also see Dr. Morrison for their dentalcare, and Dr. Morrison is so kind and patient with them even when they didn't love having dental work done. They get excited now once it's time for a cleaning! We adore Dr. Morrison and have him to thank for our beautiful smiles!